A few weeks ago, we found ourselves with an abundance of tomatoes — a mix of salad tomatoes, sauce tomatoes, heirlooms, cherry and grape tomatoes. I had been wanting to test this whole oven-dried tomato idea — which was an ideal option given that the sun hadn’t shown its face for days. I sliced the tomatoes in half — I only used the cherries and the grapes — and laid them cut-side up on a baking sheet (with the help of my 3-year-old niece). 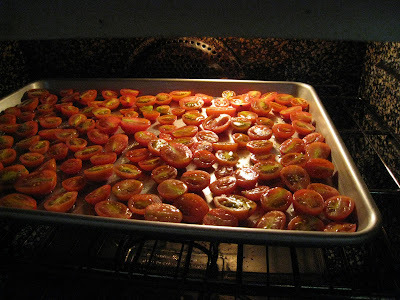 I drizzled the whole thing with extra virgin olive oil, and seasoned the ‘maters with salt and pepper. I put them in a 250 degree oven, and let them hang out for a few hours. 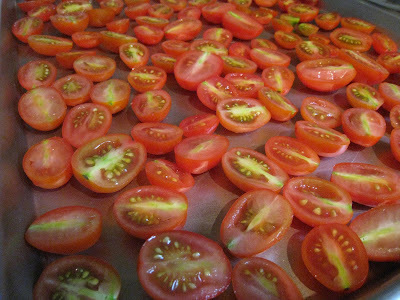 The length of time really depends on size and thickness of the tomatoes. I packed them in jars with extra virgin olive oil, and stuck ’em in the fridge. Some recipes claim that they stay good for only two weeks, but mine are still going strong. My hope is that the olive oil will take on the essence/deliciousness of the sweet tomatoes, and I’ll be able to dress salads with it or drizzle it over focaccia dough before baking. Thanks for updating me on the plagiarism. 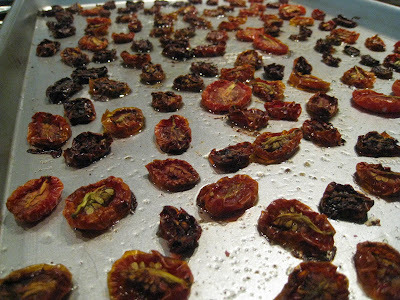 I am trying to make the person stop that blog.Oven dried tomatoes look yumm..